I am afraid of heights in wide-open spaces. I can usually deal when I’m standing still, like when I’m in a tall building, but put me in a car that is traversing a mountain and you’ll find me in the back seat with my head between my knees. There’s something about motion and space that hijacks my amygdala, the ancient part of the brain associated with the stress response. My entire being freezes. I’m unable to act rationally. In the past two years I’ve been lucky enough to travel to some awesome places —Big Sur, CA; Macchu Picchu, Peru; and Amalfi Coast, Italy. Each of these adventures involved big mountains and open spaces. My perceived fear of heights, open space, and motion became debilitating. Instead of looking out at the Mediterranean Sea on our drive from Sorrento to Positano, I looked up at the hillside. Instead of enjoying the greenery and lushness of the scenery during the bus trip up the mountain to Machu Picchu, my head was on my daughter’s shoulder with eyes closed. C’mon, Cara … really? Is this the best you can do? My husband and daughters are always amazed to see their normally empowered wife and mom in a state of sheer terror. They used to laugh at me and even egg me on until they realized my freak outs were based on a deeply entrenched fear — not a real fear, as I’ve learned, but a perceived fear. Let’s take a look. Real fear has helped our species survive. Running back into the cave helped our ancestors avoid dangerous animals. Real fear occurs in life-threatening moments, like when the car in front of you slams on its brakes or the dish towel catches on fire while you’re cooking. Perceived fear, on the other hand, is generated from your mind such as the fear of missing out, the fear of the unknown, and the fear of death. These self-generated fears are constructed in your busy mind and are often described as False Evidence Appearing Real — FEAR. Perceived fear occurs when you have thoughts of your neighbor’s terrifying dog behind the fence, you expect to get fired when your boss asks to meet with you, or you feel you might fall over a cliff, even though you’re safely behind the guard rail. Real fear keeps you alive. Perceived fear imprisons you in your mind. Perceived fear cuts you off from your direct experience of what is happening right now. Your body reacts the same way to a perceived fear as it does to a real one. During this physical response, your body releases stress hormones stimulating your fight or flight response. Instinctively this response prepares you to go into battle or flee. You become tense and rigid, not only physically, but also mentally and emotionally. Perceived fear feels like real fear, until you’re willing to face it directly. Fast forward to today. I am taking an online series called Flow Fundamentals hosted by the Flow Genome Project. I’m learning how to “hack” the flow state — a peak performance state where we feel our best and perform our best. One of the triggers for hacking flow involves challenge, a.k.a. being uncomfortable and facing your fears. Last week in the course we were given the assignment to challenge ourselves in a way I really didn’t want to. As you know now, there’s little in this world that makes me more uncomfortable than being up high in wide-open space while moving. I knew what I had to do, and it scared the crap out of me! 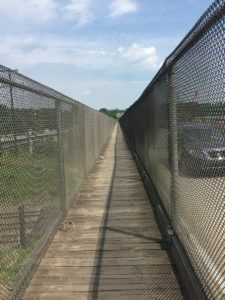 There’s a bridge with a narrow bike path near my house that crosses the Schuylkill River (don’t even attempt to pronounce it if you’re not from Philly.) The bridge is about to close, as it’s really sketchy. (There’s a new bike bridge that’s about to open.) This old bridge frightens me. It feels completely unsafe. The bike path runs alongside a busy highway, a mere feet away, and the floor of the bridge is an old, creaky wooden path. So on one side is the rush of 18-wheelers barreling towards you and on the other is a sheer drop to the river. The only thing separating you from a free fall is an old metal fence. Riding over this bridge on my bike is about as scary as it gets for me, throwing off my equilibrium and freaking me out. There’s no car to “protect” me. There’s just me on my bike alongside speeding trucks, a sheer drop to the river, an old fence and, a narrow wooden path. For the assignment I chose to visit the bike path before it closes. 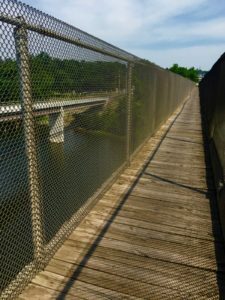 I decided to go back to the bridge and face my “perceived” fear. Instead of just looking down the whole time wishing for the moment to pass and hoping to survive the ordeal, I committed to thrive, to seize the moment and look my perceived fear in the face. I decided to slay my dragon once and for all. And so I did. Instead of riding my bike across the bridge looking down the whole time, I focused on deepening my breath as I do during a yoga practice. I rode slowly with my head up to the middle of the bridge where I stopped. (I did! I really stopped!) I got off my bike and looked around to experience the vast view of the river and the noise of the highway buzzing behind me. I would say I was in the flow state— big time. I was on the edge of my comfort zone. It was a high-definition, high-voltage experience I write about in my book, On The Verge. It was exhilarating. It was a massive victory for me. What I learned from this experiment is that perceived fear dissolves in front of your eyes when you meet it while physically calm and mentally focused. My experience on the bridge last week has given me the confidence that I can do it again, that I can slay the dragon, even at a high altitude and with bigger stakes at hand. There are higher bridges to conquer and mountains to traverse. Next time I’m traveling I plan on deepening my breath, lifting my head up, and looking out at the grandeur of this beautiful planet. I think I should start packing my bags!